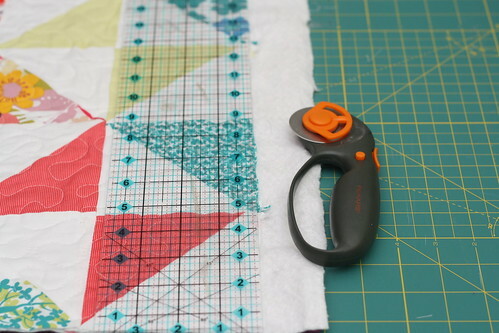 Remember this tutorial I did on machine quilting? 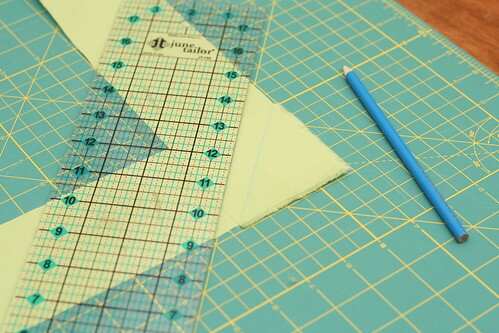 And I mentioned I would do a tutorial on quilt binding too. Well then I got busy having a baby and all and never got around to it, but here it is! 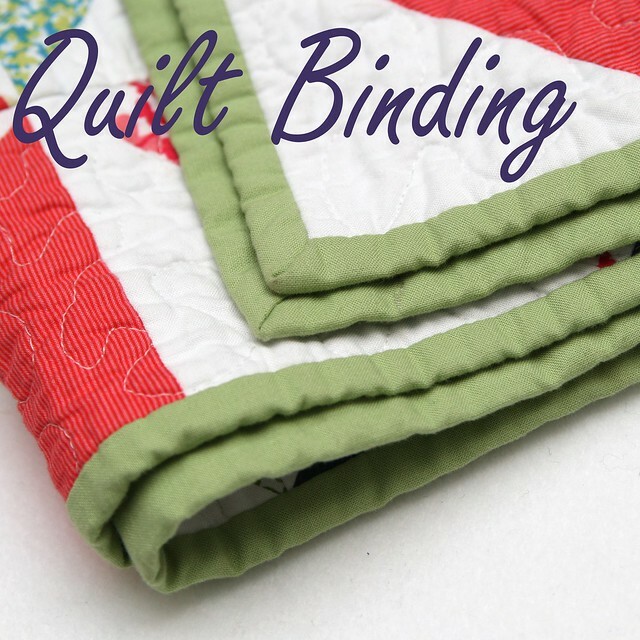 I am going to show you two different techniques for quilt binding. The first, finishing by hand, takes longer but I think is a bit nicer. The second, finishing by machine, is much faster. 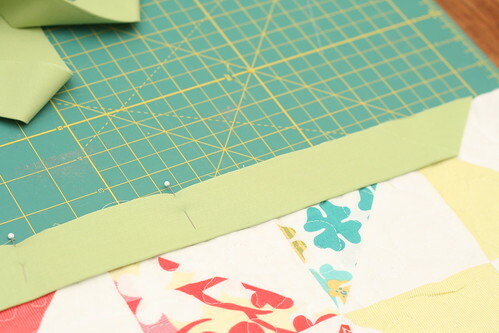 2) Cut your binding fabric into 3" strips, you will need enough strips to go all the way around your quilt. 3) Connect your strips. Line 2 of them up at a right angle to each other with right sides together as shown in the picture below. 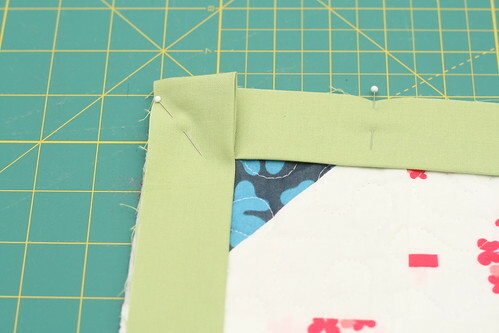 Draw a line diagonally from the corner of the top piece to the corner of the bottom piece and pin them together. 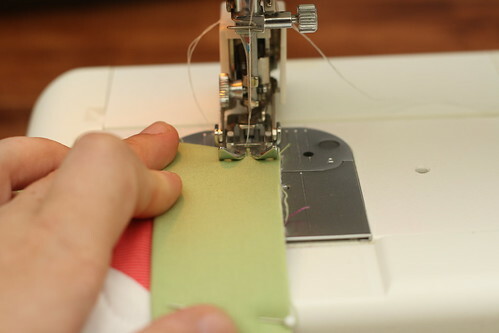 4) Sew along the line. 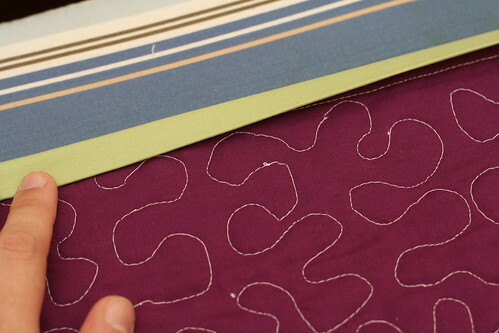 Repeat this step to join all your strips together to make one really long strip. 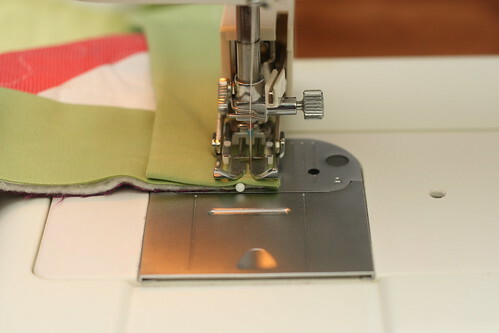 5) Trim off the extra and press the seams open. 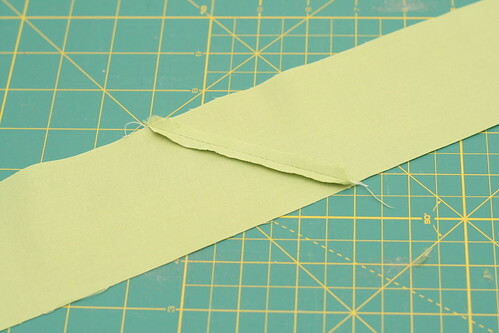 7) Fold your strip in half and press wrong sides together. 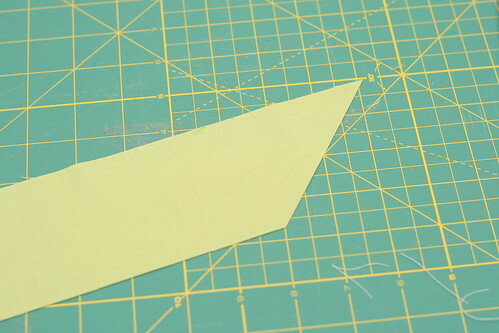 9) When you get to a corner, place a pin on the angle about 1/2" from the edge. 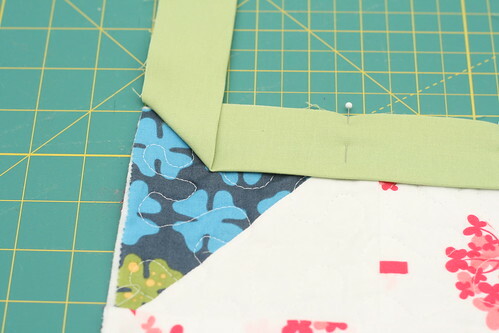 10) Fold the binding 90 degrees so it is laying straight up from the edge. 11) Fold the binding straight down with the fold lining up with the edge of the quilt. 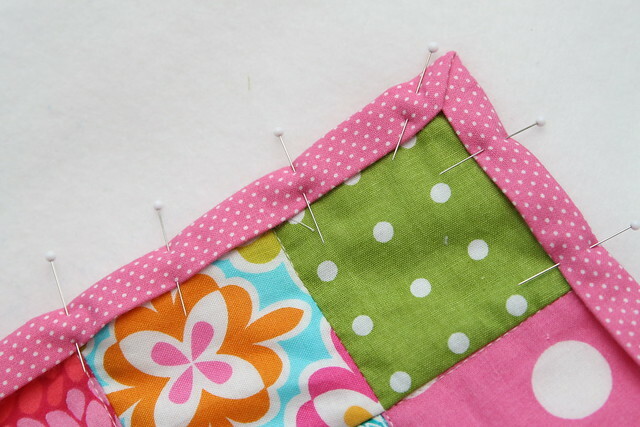 Place a pin of the other side of the corner. 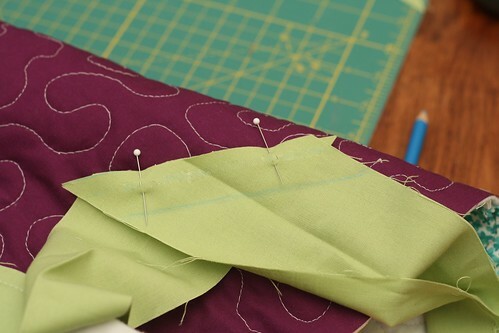 12) Continue pinning all they way around your quilt, when you get back to where you started, stop pinning about 6"-8" from your starting point. 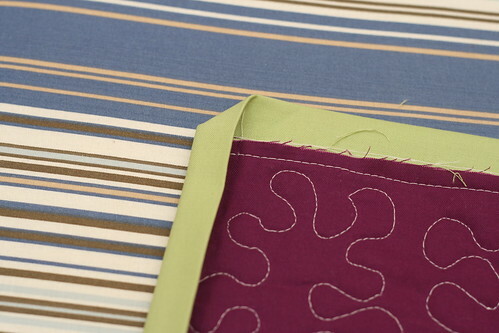 13) Sew the binding to your quilt where you have it pinned with 1/4" seam allowance (don't sew those 6"-8" of unpinned binding at the ends). A walking foot is helpful on this part but if you don't have one, just take your time and use lots of pins. 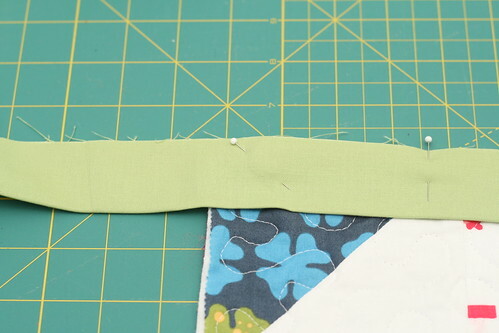 14) When you get to the corner, stop sewing 1/4" from the edge and back stitch. Remove the quilt from the machine. 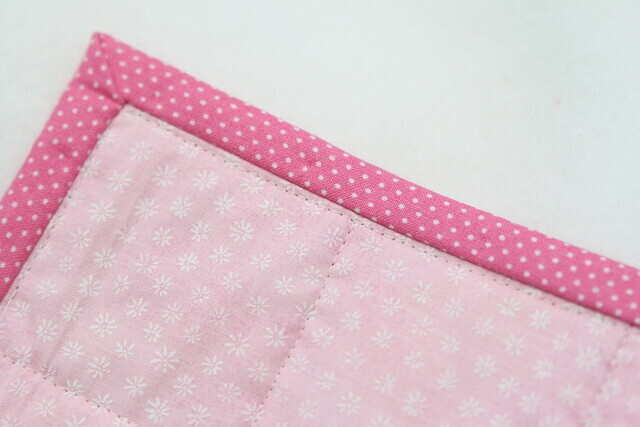 15) Flip the little flap in the corner the other way, and start sewing again from the edge of the quilt. 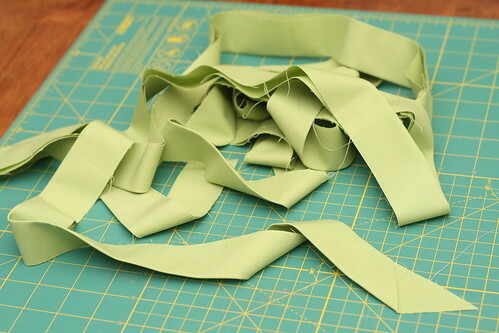 16) After you have finished sewing the binding where you had it pinned, unfold the loose ends of binding. 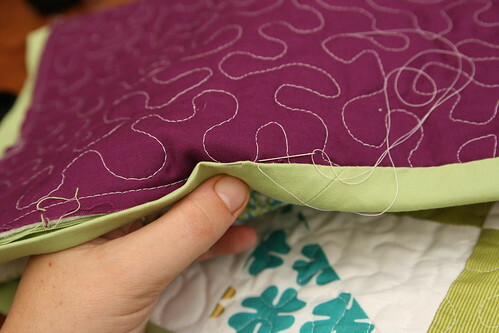 Lay them flat along the edge of the quilt and mark where the angled end of the binding meets the other side. 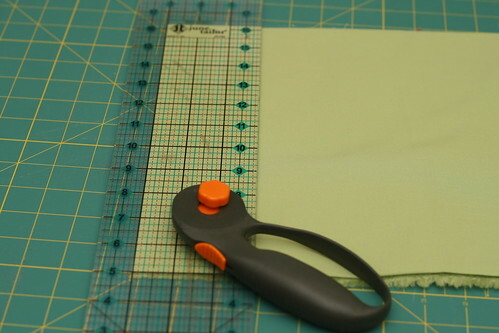 17) Cut the binding 1/2" past the line you drew. 18) Pin the ends together, when you line them up the points should hang over about 1/4". 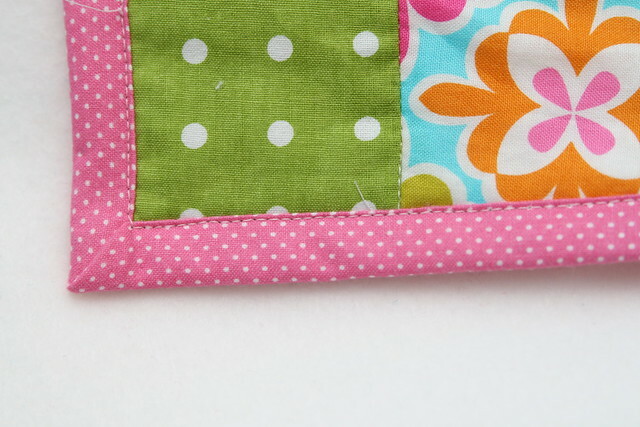 Sew along the edge with 1/4" allowance. 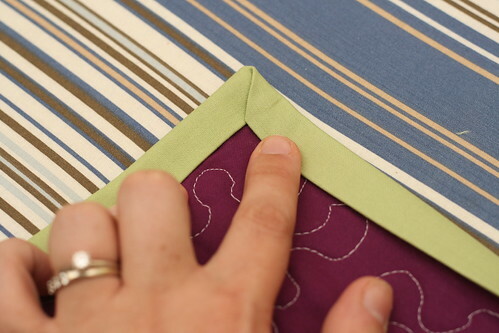 19) Refold the binding and pin it to the edge of the quilt. 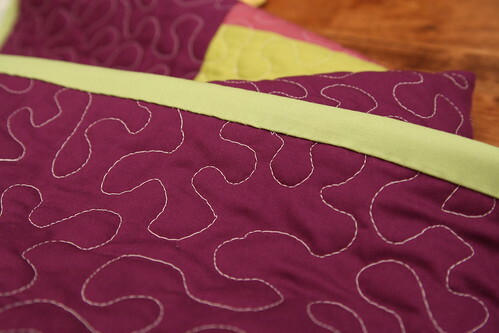 21) Press the binding up and over the edge of the quilt. You can pin it in place or use clips to keep it in place if you would like. I don't pin it down when I am planning on sewing it by hand, I like to curl up on the couch with it while I sew and the pins just get in the way. 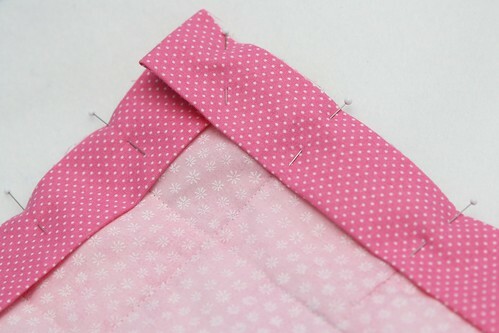 22) Sew the binding to the back with a blind stitch. 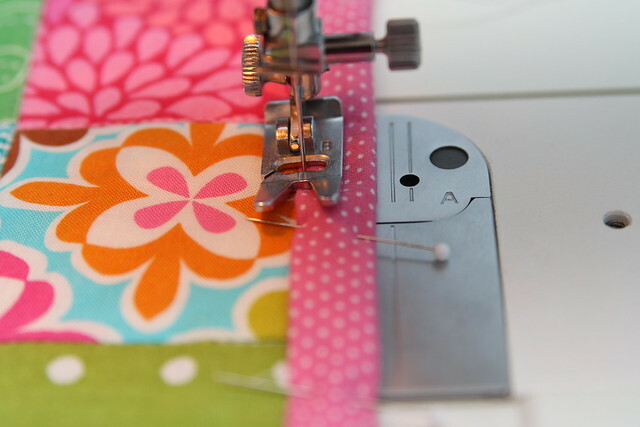 Start by tying a knot in your thread and sewing through the binding fabric, bringing your needle out on the fold. 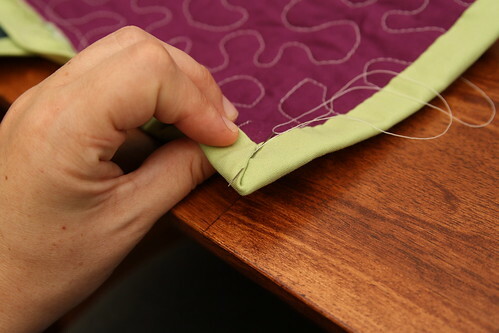 pull the thread through and give it a little tug so the knot you tied goes inside the binding. Don't pull too hard or you will pull the thread all the way out. 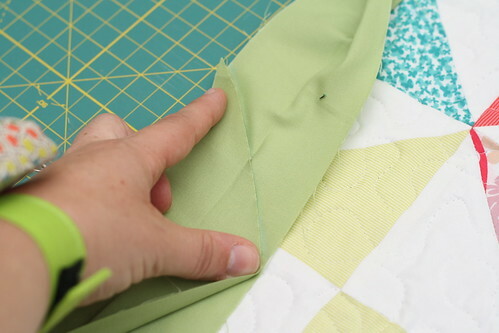 23) Dig your needle into the back of the quilt but don't go all the way through to the front. 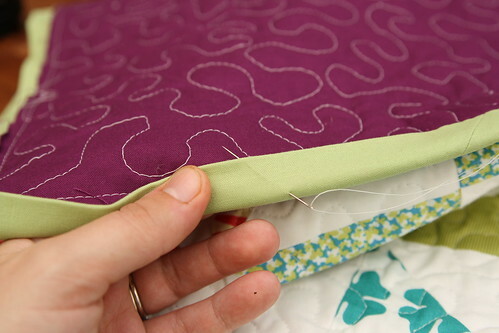 Then push it into the binding and bring the needle back out on the fold. This takes some practice but after doing it a few times it gets much easier. 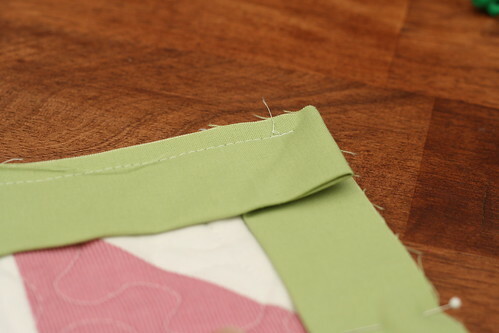 24) When you get to the corner, sew the corners closed using a blind stitch. 25) When you run out of thread or finish sewing the trim, simply tie a knot in the thread and stitch through the backing of the quilt. Tug on your need so the knot gets pulled inside the quilt, cut off the rest of the string. 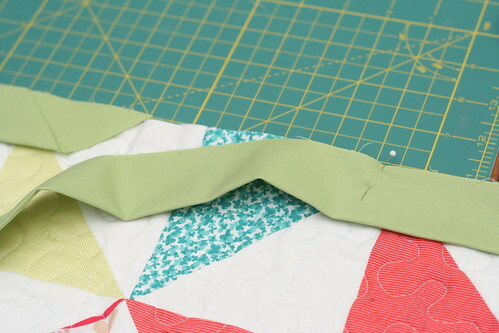 Follow steps 1-20 above, but Instead of pinning and sewing your binding to the front of the quilt you will sew it to the back. 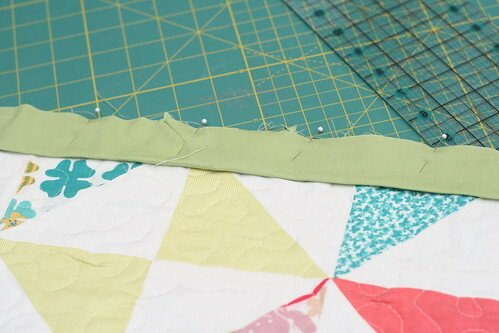 21) After sewing your binding to the back of your quilt, press the binding up and over the edge of your quilt and pin it in place. I like to use a lot of pins. 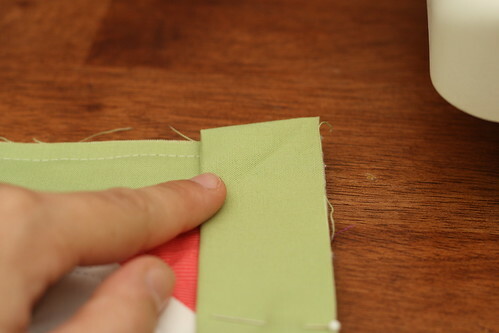 22) Sew along the fold of the binding. 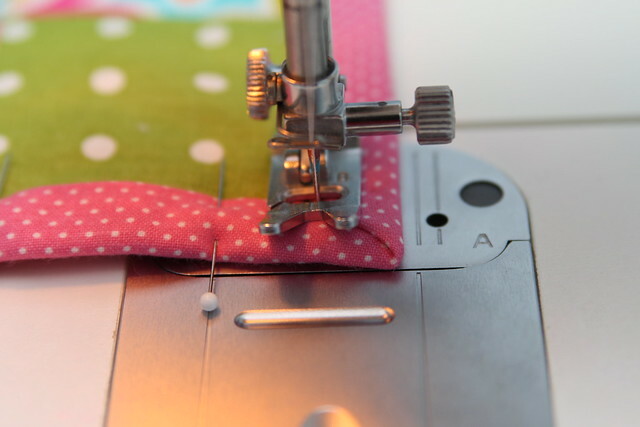 If you end up with any spots that didn't get sewn down, you can run them back through your machine or sew them shut by hand. Excellent tutorial!! Thanks so much!